Illegal, Unreported and Unregulated (IUU) Fishing is one of the main issues in the fishery industry. This issue can’t be limited to only developed or developing nations and all nations can be the victim of this act. There are three bottle necks in controlling IUU fishing, first the coastal state, second the flagged state and finally the port state. Many Coastal states are not capable of protecting and monitoring their waters due to high costs; also many flagged states are not eager to monitor their vessels due to the same issue. European Union (EU) as one of the largest seafood consuming region plays an important role in preventing IUU fishing. This paper explains, the case of Korea as the 3rd largest distant water fishing nation in the world. South Korea was listed in the IUU black list in 2013 and was forced by two EU leverages (Normative Power and Market Power) to take necessary actions such as applying proper monitoring systems to all its distant water fishing vessels. Due to these acts, Korea was removed from IUU list in 2015. Oceans are the most important protein source for nearly 2.6 million people worldwide UNDP (2010). However, in FAO’s 2010 report, it is stated that 85% of the world’s marine fish stocks were fully exploited, overexploited or depleted FAO (2010). With consideration of some evidence that shows catch data for China might be inflated (Watson, R., Pauly, D. 2001), China, South Korea, Japan, Indonesia, India, Russia, Peru, USA and Norway have the highest wild catch rates. In both Exclusive Economic Zones (EEZs) and the high seas Illegal, unreported and unregulated (IUU) fishing is a global problem (Marine Resources Assessment Group - MRAG 2005). It is harder to track the IUU fishing in high seas and for highly migratory stocks because of transient nature of these species (Marine Resources Assessment Group - MRAG 2005). It is important to note that Illegal activity is not restricted to developing countries. For example in European Community, around 10% of European fleets were committed illegal fishing in 2003 (European Commission). According to FAO report, more than 53% of marine fish stocks are fully exploited (International Sustainability Unit, “Towards Global Sustainable Fisheries”, February 2012). In Asia, the trend shows at least 30% decrease of fish stocks since the 1970s due to IUU fishing (Asian Fishing Communities Suffer as Fish Stocks in Region Decline”, Voice of America 2007). In fact, annually in Asia-Pacific Region, 3.4- 8.1 million tons of fish are taken by IUU fishing (Asia-Pacific Economic Cooperation Fisheries Working Group). Globally due to IUU fishing, human kind loses between 10 to 23 Billion USD annually, this amount is estimated for 11 to 26 Million Metric Tons (MT) of fish (Agnew, D.J., Pearce, J., Pramod, G., Peatman, T., Watson, R., et al. (2009). The highest level of IUU fishing in the world is spotted in Western Africa with the estimated value of 828 million USD to 1.6 Billion USD per year (Agnew, D.J., Pearce, J., Pramod, G., Peatman, T., Watson, R., et al. 2009). European Union (EU) is the world largest market for seafood products (Asche, F., Smith, M.D. 2010). Although globally fish stocks currently being overfished, the EU seafood consumption remains high (European Commission 2009a). By sourcing and importing seafood products from other regions, the EU has been able to expand its level of seafood consumption (NEF 2011). Using the size of EU market and historical international trade agreements, the world’s most powerful seafood trade bloc was created in this region (Meunier, S., Nicolaidis, K. 2006). On the other hand, Korea is considered as top 5 fishing nation in the world. South Korean capture fisheries production in 2014 was 1,758,726 MT that was nearly 2% of world capture fisheries production (Ministry of Ocean and Fisheries-MOF 2015). In recent years, the Korean fishing industry has experienced significant changes and faced various challenges including a decrease in fishing populations; dwindle in the size of the industry and government financial transfers; and an increase in oil prices. Korea’s EEZ fisheries are the pillars of the coastal communities contribute to the balanced development of the country and serve as the major supplier of fisheries products for domestic consumers (Lee, S.G., Rahimi Midani, A. 2015). Distant water Fisheries (DWF) are taking up an important part in Korea’s fisheries exports, and aquaculture is contributing to income generation for aqua farmers through highly valued fish production. This paper aims to show how the 3rd largest fishing nation blacklisted as an IUU nation and what policies helped Korea to face this issue. Also, it shows that how firm stand from the top seafood consuming nations forced Korea into changing its DWF policies. It is important to understand how South Korea is trying to keep its leading role by following international rules and regulations. Despite this effort, over the last couple of years many cases of IUU fishing activities and human right abuses have been reported that led Korea to be listed among nine other IUU fishing nations (South Korean Distant Water Fisheries 2013). This put Korea in EU’s black list and forced EU to apply its external power on Korea in order to prevent IUU fishing. This paper has 5 sections including introduction. In the second part of this paper, we discuss the EU external powers since the main force behind preventing Korea from IUU fishing was EU normative and market power. The third section is dedicated to analyze the structure of Korean Distant Water Fisheries. In the fourth part, we have explained the case that led South Korea to be listed as an IUU nation and the leverages used by EU as part of EU’s IUU regulation will be discussed in this section. And in the final part of this section, we have explored the pattern that South Korean government created for preventing IUU fishing by Korean vessels and helped removing Korea from the blacklist. Finally, we conclude our findings for future reference of nations which are facing similar problem. As we have pointed out in the introduction section, one of largest seafood market is located in EU region and so many seafood products are exported to this area. For this reason, EU has strong market base tools to expand sustainable fisheries governance globally. In terms of IUU, EU uses this power to actively promote rules and regulations, norms and sustainable practices outside its territory (Miller, A.M.M., Bush, S.R., Mol, A.P.J. 2014). As IUU fishing has clear environmental and economic influence globally, it is important for EU to find the best nexus between trade and sustainability. To understand the power of EU to influence domestic institutions, policies and regulations in third countries, two schools are presented; ‘Market power’ Europe (Damro, C. 2012) and ‘Normative Power’ Europe (Manners, I. 2002). The first school was presented by Damro and is a response to the vast number of literature on Normative Power Europe (Manners, I. 2002). The Market Power Europe means foreign countries which are interested in having shares in EU market, should follow EU’s rules and regulations and in case of violating them, they face associated costs (Bauer, M.W., Knill, C., Pitschel, D (2007). With increasing demand for seafood products in European markets, there is more pressure on the third country to rearrange their regulations to avoid the consequences applied by EU. EU can depend on its market power for the policies related to market such as environment, market compositions and standards (Lavenex, S. 2011). EU manipulates the third country’s market by providing positive and negative incentives (Miller, A.M.M., Bush, S.R., Mol, A.P.J. 2014). This is important since the cost-benefit balance of the third country falls in line with having interaction with EU. In the case of normative power, it is argued that this power is built on a normative basis. The proof for this power can be seen in bold role of EU in multilateral agreements and international movements for environmental matters (Falkner, R. 2007). The role of EU’s normative power has been pointed out in many studies related to international environmental politics but in case of fisheries policies and governance systems there are no sufficient studies to show the effect of this power on the fisheries sector. According to Damro, the EU external power is derived from a combination of market and normative interaction, and so EU’s IUU regulation uses both normative power and market power to affect third countries. It is important to understand that the power is never uni-directional and always depends on both parties (Miller, A.M.M., Bush, S.R., Mol, A.P.J. 2014). EU’s 2010 IUU Regulation (EC Regulation no.1005/2008) allowed EU to implement it powers beyond its waters. According to this regulation, EU can forbid IUU fishing nation to import seafood products in EU. The regulation emphasizes that flag, coastal and port states should present three requirements before the product enter the EU market (Miller, A.M.M., Bush, S.R., Mol, A.P.J. 2014). First, catch certification scheme that ensures flag states can prove their catch is harvested in accordance with coastal states’ fisheries management system. Second, the flag states present their list of vessels to EU so all the vessels be included in EU’s vessel list. Finally, none of the third parties should be included in EU’s IUU black list. EU sees this regulation as the most efficient tool to face IUU fishing (Lövin, I. 2009). Thus, for any trade activities with EU, the exporting parties should satisfy the EU’s IUU regulation (Market Power) and also conduct joint agreements with EU such as Fisheries Partnership Agreements (Normative Power). As mentioned, EU can use both market and normative power to face IUU fishing and in case of South Korea as we will explain in next section, EU used both of these leverages to prevent Korean DWF from IUU activities. Korea made the first trial fishing operation of tuna long liner successful in the Indian Ocean in 1957, and after then with history of 51 years, has accomplished a remarkable development by the positive and efficient support of the government to the overseas fishery portion and also by the enthusiastic participations of overseas fisheries industries. The capacity of fishing vessels, less than 100 vessels in early 1960's, had greatly expanded up to 850, setting the highest record in the history in the latter part of 1970's. Even in the view of production's regard, it was far less than 100,000M/T at first in 1960's, but it had increased almost up to 500,000M/T in the latter part of 1970's. Export also 20 million USD only in 1960's, but it had grown remarkably that it exceeded 300 million USD in the latter part of 1970's. 380 fishing vessels are rendering the utmost efforts for the national wealth and the development of food resource with exertion of about 10,000 crews, centered at 24 bases over the world. South Korea industry endeavoring for the promotion of crews’ welfare, is much more exerting our efforts for the exploitation of new fishing ground, replacement of outworn vessels with new ones together with the management rationalization and improvement of financial structure, fully concentrating to the increase of production and export of fish products for the national economy taking into account the resources and environmental factors. Korea maintains 24 foreign fishing bases in the 20 coastal states; they are 11 in the Pacific, 11 in the Atlantic and 2 in the Indian Ocean. The numbers of vessels which operate making use of the bases are 223 in the Pacific, 132 in the Atlantic and 25 in the Indian Ocean. Major bases by the ocean are Guam, Tahiti in the Pacific; Stanley, Paramaribo, Montevido in the Atlantic; Muscut, Salalah in the Indian Ocean (Table 1). Table 1: Major Ports of Distant Water Fisheries of South Korea Source: Korean Fisheries Major Policies and Resource Management Book. Korea has become the 68th party to the United Nations Fish Stock Agreement in February 2008 and is acting as a member of 16 international fisheries organizations such as ICCAT (International Commission for the Conservation of Atlantic Tunas), CCSBT (Committee for the Conservation of Southern Bluefin Tuna), IWC (International Whaling Commission), IATTC (Inter-American Tropical Tuna Commission) and WCPFC (Western and Central Pacific Fisheries Commission). Table 2 shows all the international fisheries organizations along with the dates that Korea joined these organizations. Table 2: South Korea joined International Fisheries Organizations Source: Korean Fisheries Major Policies and Resource Management Book. Table 3, presents bilateral fishery agreements between Korea and foreign countries. Access to Korean waters by foreign-flagged vessels was allowed only for Japan and China on a reciprocal basis, according to the bilateral fishery agreements. Table 3: Korean Bilateral Fishery Agreements and Access to Foreign Waters Source: Korean Fisheries Major Policies and Resource Management Book. In 2014, the total production from distant water fisheries stood at 669,140 MT, a 12% increase from the previous year (Figure 1). Figure 1: Distant Water Fisheries Total Production (MT) Source: Korean Fisheries Yearbook . Main species in the fisheries included the tuna (Skipjack, Yellow fin and Bigeye etc. ), Squid and Pollack, all combined to take up more than 70% of the total distant water fisheries production. In 2014, total value was 1,275.222 Million Korean Won (KRW) and was 9.5% lower than 2013 (Figure 2). This was mainly because of the fall in Tuna Capture production in 2013. Figure 3 shows the number of Korean distant water fishing vessels by waters in the last 10 years. As it is shown, the number vessels decreased from 410 vessels to 333 from 2005 till 2014. 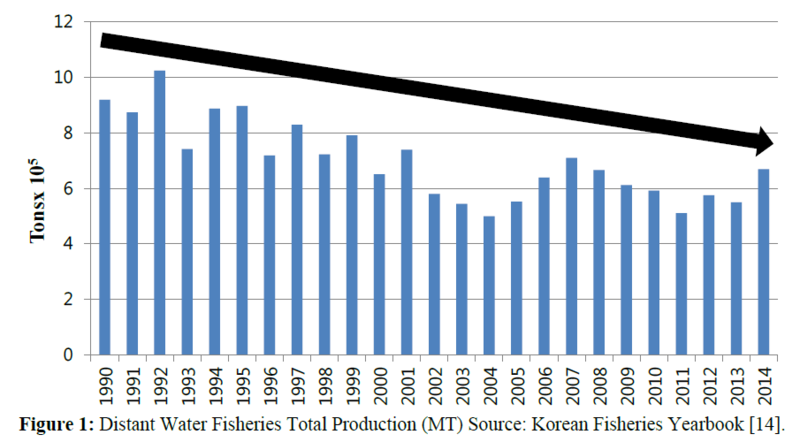 Figure 2: South Korea’s Distant Water Fisheries Total Production Value (KRW) Source: Korean Fisheries Yearbook . Figure 3: Number South Korean Distant Water fishing Vessels from 2005 till 2014 by Oceans Source: Korean Fisheries Yearbook . All over the world, protection of fishery resources and the related regulations are based on the trend to enhance resource management. However, increasing global demand for seafood, made Korean fishing industry to accelerate the expansion of DWF. For this reason, controlling and tracking the Korean vessels is becoming harder and trickier every day. The Korean distant water fishing can be categorized in 4 main fisheries. These fisheries are: Tuna Fishery, Trawl Fishery, Squid Fishery and Saury Lever-Lift Net. Below we briefly explain about the history of each fishery and then discuss the major issues in Korean distant fishery. It has been 58 years since the first Tuna long-liner operated in 1957 as the first step of Korean DWF (Lee, S.G. 2011). Tuna long-liners have been operating in the high-seas and within the coastal states in the South Pacific as the main fishing grounds and exporting their catches mainly to Japan. The quantity produced in 2014 was up to 38,439MT, and the exporting record in amount was 178,706 Million KRW (Ministry of Ocean and Fisheries -MOF 2015). On the Other hand, in 1971 the Tuna purse-seining fishery in Korea was initiated by accessing into the Eastern Pacific fishing ground with 3 vessels (Lee, S.G. 2011). Helicopter-aided mass operations were introduced in 1979 for the first time and the number of vessels increased to 32 as of the end of 2014 (Lee, S.G. 2011). Most of the productions are supplied to the Korean processors for domestic consumption, and the remainders are being exported to foreign canneries. In 2014, the catch was 278,031 MT and the value of export was 197,127Million KRW (Ministry of Ocean and Fisheries –MOF 2015). In 1966 , Korea deployed 8 trawl fishing vessels into the Atlantic Ocean in 1966, and through the steady investment thereafter the fleet grew to 319 in 1976 (National Fisheries Research and Development Institute-NFRDI 2009). However, since 1977 when 200 miles exclusive economic zones were declared, the number of vessels has been gradually decreased down to 89 vessels as of the end of 2014 (Ministry of Ocean and Fisheries -MOF 2015). Those vessels are classified as 6 North Pacific trawlers and 89 as foreignbased ones; among them 25 vessels are operating in the Pacific, 57 in the Atlantic and 7 in the Indian Ocean as their main fishing grounds (Lee, S.G. 2004). The Pollock, the main species caught by trawl fishing in the North Pacific has been highlighted as an important source of protein supply in the Korean market, but the fishing grounds are being reduced gradually. The quota-fishing and Korea-U.S.A joint fishing projects in the Bering Sea were already closed in the latter part of 1980's, and the trawl fisheries thereafter had been retired only on fishing operations in the highseas that the entry into Russian water was expedited from 1989 (FAO. 2005). Finally, Korea signed Fisheries Agreement with the Russia in 1991 resulting in successful Pollack fishing (Lee, S.G. 2004). The total volume of trawl catch showed 193,986 MT, and export amounted up to 103,022 Million KRW in 2014 (Ministry of Ocean and Fisheries-MOF 2015). The squid fisheries started in 1979 by accessing the drift net fisheries for the catch of red squid in the North Pacific and such full scale fishing operations from 1982 but it had been completely closed up under the UN resolution as of the end of 1992 (Lee, S.G. (2004). The number of fishing vessels and catch was steadily increased due to development of new fishing ground together with development of New Zealand and Australian waters, and the new turning point of Korean Squid Fisheries was provided by proceeding into Falkland’s waters of the South Western Atlantic Ocean in 1985. Also, in 1990s Peruvian fishing ground was added to get raw materials for processing. The production in 2014 was up to 167,023MT and the value of export was 36,085 Million KRW (Ministry of Ocean and Fisheries-MOF 2015). By three trial fishing vessels deployed to the high-seas in the North Western Pacific for the first time in 1985 the Saury Lever- Lift Net was initiated. Such fishery, converted into a subject to formal permit from 1987, made both the number of fishing vessels and the production increased every year by overcoming difficulties of unfamiliar fishing technology in the early stage. The number of vessels as of the end of 2014 was 21 vessels including 20 dual fishery ones, and production was 23,431MT (Ministry of Ocean and Fisheries –MOF 2015). FAO (2005) considered the following two factors that can influence the country’s economic development by the fisheries sector: first, by contributing to foreign exchange earnings and second, its contribution to food security and nutrition. South Korea can be a good example to show the contribution of the fishery sector to economic development of a nation since in 1961. At the start of South Korea’s modern economic development, the country held virtually no capital stock. Railroads, plants, dams, and factories left by the Japanese had been destroyed during the Korean War. The majority of fertilizer plants, electric power plants, and mining operations were located in North Korea, reflecting natural resource distribution and Japanese investments. Industry in South Korea, in contrast, focused on agriculture, fishing, and light manufacturing (Kim S.H. 2007). In 1961, mean per capita capital stock in the South Korean economy was 280 USD, a figure that increased to 52,700 USD by 1995 (National Statistical Office). Following the military coup of 1961, the government developed successive fiveyear plans focused on self-sustaining economic development and the expansion of basic industries and infrastructure (Kim S.H. 2007). Struggling with the effects of war, the Korean government turned to oceans as an important source of jobs, food, and exports Pyo, H.K. (1953-2000). From the 1950s to the 1970s, the fishery sector played an important role in bringing in foreign currency by exporting seafood products. However, at the beginning of the 21st century this trend changed, and fishery imports have exceeded exports (OECD-2003). Over the past two decades, five year economic development plans have provided a framework for the Korean fishing industry. Fish catches increased from 470,000 MT in 1962 to over 3 million MT in 2014, while revenue from fishery exports jumped up from 12.3 million USD to 2.1 billion USD (Lee, S.G. 2004). Fishing vessel tonnage rose from 161,000t in 1961 to over 600,000t in 2012 (MAFF). The number of vessels increased from 45,000 to 90,000 in the 1990s and has since decreased to the current 75,000 (Korean Fisheries Yearbook 2013). The Korean economy has developed quickly, and overexploitation of the ocean resources within the South Korean territory has led to depletion of many fish stocks. Approximately 130,000 people are employed in Korean fisheries, comprising 54% male and 46% female workers. The fishery sector accounted for nearly 0.2% of the Korean GDP in 2014 (MIFAFF). Although fisheries sector fulfilled its contribution to Korean economy but sudden expansion of this sector created major problems both in the case of resource management and governance system as well as monitoring. Many of Korean flagged vessels fish in West African Waters. Additionally, West African waters have the highest IUU fishing in the world (FAO. 2005). Due to IUU activities multiple issues such as economic loss and food insecurity for coastal communities occurred in this region. In this paper, in order to point out the South Korean IUU activities in Western African waters, we have used Environmental Justice Foundation’s (EJF) report that was presented to EU commission leading to implementation of heavy sanctions on Korean DWF. According to the EJF’s report, from 1st of January 2010 until 31st July 2012, 252cases of IUU fishing was only reported in Inland waters of Sierra Leone. All these cases were filmed by EJF and were presented to EU commission as evidences IUU fishing. At the beginning of 2011, 4 Korean flagged vessels were seen in Sierra Leone waters. The vessels were conducting IUU fishing in inland waters of Sierra Leone and all of them were authorized to export to EU markets. Additional to IUU fishing, the vessels were seen attacking local fishermen and damaging their fishing equipment. Also, one of the vessels had at least 5 under age crew members that were Senegal citizens (Environmental Justice Foundation 2012). The EJF’s report showed that these vessels were also exporting high value species such as Yellow Croaker to Korea. Although lack of Vessel Identifier (VI) prevented the authorities to detect the vessel but from 2011 to 2013 similar cases were reported and the local staffs of EJF’s have documented the names of these vessels as: Marcia 707, 515 Amapola, Medra and Seta 70. Due to lack of monitoring, multiple violations by Korean fishing vessels were reported in other countries’ waters. On the other hand, annually Korea exports 100 Million USD of Seafood to Europe that eagers the Korean fishing industries to pursue any action to keep EUs market. EJF’s report showed that many of these IUU products were imported into EU and so EJF tracked the imported products in Las Palmas. It became clear that high competition among fishing nations, high demands and lack of ability to control the flagged vessels by the coastal states encouraged Korean fishing vessels to in multiple cases commit IUU fishing. As an example, EJF showed that couple of days before the products were shipped to Las Palmas; multiple auctions were conducted inside the Korean flagged vessel. Following the EJF’s report and investigations carried out by EU commission, sanctions were implemented on 14 Korean flagged vessels and all were fined (Environmental Justice Foundation 2012). Also, EU commission has informed the Korean government about the necessity of Vessel Monitoring System (VMS) on all Korean flagged vessels. Despite all these efforts that prevented multiple Korean vessels from conducting IUU fishing, many Korean flagged vessels continued to operate until 2013 and finally, in 2013 EU added Korea as an IUU nation to its black list. As of 2011, 359 Korean-flagged vessels are authorized to fish outside the EEZ of Korea. According to United Nations Convention on the Law of the Sea (UNCLOS) all nations are required to control and monitor the fishing vessels flying their flags. However, multiple studies showed that many commercial fishing vessels are out of control and break the laws by fishing inside EEZs, refusing to pay fines, using band fishing equipment, labor violation and etc. (Environmental Justice Foundation 2012). This not only destroys the environment and depletes the fish stocks but also hurts the local fishing communities. Despite the agreements that Korea signed with many coastal nations as well as the ones this country has with many RFMOs, multiple IUU cases have been reported over the last couple of years that led Korea to be considered in IUU fishing nation’s list. The EU strongly asked South Korea to take necessary actions such as including Monitoring Systems in all Korean vessels. However, at first due to high costs of applying these systems, many DWF vessels opposed having it. Being blacklisted by EU shocked the nation and endangered millions of dollars of Korean seafood export to EU. As we have explained, EU can use two leverages to control the IUU fishing (Normative and Market). In case of South Korea, after being black listed by EU, both of these leverages were applied. From trade prospective, import of Korean seafood products into EU was forbidden. Korean canned Tuna has an importance for Korea. Germany, United Kingdom, France, Spain and Belgium consume most of the canned Tuna produced by Korean company in Senegal. On the other hand, Korea was in the midst of signing a Free Trade Agreement (FTA) with EU. Being considered in EU’s black list stopped the negotiations between Korea and EU members. According to 2010 EU’s IUU regulations, the origin of the products should be accepted by the EU members and since in many cases Korean DWF vessels couldn’t reach this requirement, they couldn’t export their products into EU. In case of normative power, since Korea is part of many international organizations (Table 2), EU’s black list forced Korea to clear its reputation and create a transparent DWF. Korean government both shocked and disappointed by EU actions agreed to take the necessary actions in order to be removed from the list. To face IUU issue and in order to better control the Korean vessels which are operating in open-seas or in other countries territories, Korean government created a National Plan of Action that includes multiple ways to prevent Korean flagged vessels from IUU fishing. 5. To expand ties with coastal developing states. 6. Stronger reporting requirements for better MCS. Applying the MCS system as well as having a proper governance system in place, helped Korean DWF to be removed from the IUU list in 2015. It is also important to note that, better communication between Korean government and DWF companies were implemented after introducing the National Plan of Action causing removal of nearly 26 inefficient DWF vessels. South Korea stands as the third largest DWF nation in the world. However, as we have shown in this paper, despite the leading role of Korea, this country failed to monitor and prevent its DWF vessels from committing IUU fishing. This became clearer, once EU nations that were mostly the final destination of Korean seafood products started to ask more questions about the served seafood products in their countries. The case became more interesting as Korean DWF vessels refused to apply monitoring systems that costed thousands of dollars and accused EU for being tough on Korean vessels. The high demand from EU market from one side and the neglect of Korean DWF vessels from another put Korean government in a difficult position and finally in 2013 the whole nation went into shock for being listed as an IUU nation. Feeling both embarrassed and shocked, Korean government agreed on reviewing its DWF policies and created a joint plan of action that covers 5 major goals. Finally, thanks to this plan all Korean DWF fishing vessels carry monitoring systems as well as regular communication patterns are being held between the coastal states and Korea. Implementing joint plan of action by Korean government and taking better monitoring policies on DWF vessels helped Korea to be removed from the black list in 2015.Additionally, the proper use of EU leverages against Korea, forced this nation to take necessary action and have more transparent and sustainable DWF. In the end, the most important lesson from Korean IUU case, can be summarize in bolding the role of the EU and its IUU regulation (EC Regulation no.1005/2008) as the strong force in preventing IUU products from entering to this region. The combination of EU’s normative and market power created a necessary incentive for Korea to take its responsibilities as one of the largest DWF nation, more seriously. UNDP. (2010) World Oceans Day: Oceans of Life. FAO. (2010)The State of World Fisheries and Aquaculture. Watson, R.,Pauly, D. (2001) Systematic Distortions in World Fisheries Catch Trends. Nature414,534-536. Marine Resources Assessment Group (MRAG) (2005) IUU Fishing on the High Seas: Impacts on Ecosystems and Future Science Needs, London. European Commission (EC) (2003)Reports from Member States on behaviours which seriously infringed the rules of the Common Fisheries Policy in Brussels, 30.5.2005 COM(2005) 207 final. International Sustainability Unit(2012) “Towards Global Sustainable Fisheries”, February.The princes charities Fund, 8. “Asian Fishing Communities Suffer as Fish Stocks in Region Decline”, Voice of America (2007). Asia-Pacific Economic Cooperation Fisheries Working Group, “Assessment of Impacts of Illegal, Unreported and Unregulated (IUU) Fishing in the Asia-Pacific” p-iii. Agnew, D.J., Pearce, J., Pramod, G., Peatman, T., Watson, R., et al. (2009) “Estimating the Worldwide Extent of Illegal Fishing” (Marine Resources Action Group and University of British Columbia. Asche, F., Smith, M.D. (2010) Trade and fisheries: key issues for the World Trade Organization. Geneva: World Trade Organization: Economic Research and Statistics Division 62. European Commission(2009a) Green paper: reform of the common fisheries policy. Brussels p-28. NEF. (2011) Fish dependenceupdate: the increasing reliance of the EU on fish from elsewhere. London: New Economics Foundation. Meunier, S., Nicolaidis, K.(2006) The European Union as a conflicted trade power. JEur Public Policy13,906-925. Ministry of Ocean and Fisheries (MOF) (2015) Korean Fisheries Year Book. Seoul. Lee, S.G., RahimiMidani, A. (2015) Fishery self-governance in fishing communities of South Korea. Mar Policy 53,27-32. South Korean Distant Water Fisheries Green Peace (2013) USA. Miller, A.M.M., Bush, S.R., Mol, A.P.J. (2014) Power Europe: EU and the illegal, unreported and unregulated tuna fisheries regulation in the West and Central Pacific Ocean. Mar Policy 45, 138-145. Damro, C (2012) Market power Europe. J Eur Public Policy 19, 682-99. Manners, I. (2002) Normative power Europe: a contradiction in terms? JCMS:J Common MarketStudies40,235-58. Bauer, M.W., Knill, C., Pitschel, D (2007) Differential Europeanization in Eastern Europe: the impact of diverse EU regulatory governance patterns. J EurIntegr29,405-23. Lavenex, S. (2011)Concentric circles of flexible ‘European’ integration: a typology of EU external governance relations. Comp EurPolitics 9, 372-93. Falkner, R. (2007)The political economy of ‘normative power’ Europe: EU environmental leadership in international biotechnology regulation. J Eur Public Policy14,507-526. Lövin, I. (2009) The EU’s role in combating illegal fishing at the global level.Chatham House 7th international forum on IUU fishing. London. Lee, S.G. (2011) Korean Fisheries Major Policies and Resource Management.Design Sesang, Busan, Korea. National Fisheries Research and Development Institute (NFRDI). (2009) Major Distant Water Fisheries in Korea. Lee, S.G. (2004) A vision of Korean fisheries and policy directions. Ministry of Maritime Affairs and Fisheries (MOMAF). FAO. (2005) Mainstreaming fisheries into national development and poverty reduction strategies: current situation and opportunities. Rome, Italy. Kim S.H. (2007) Finance and growth of the Korean economy from 1960 to 2004.Seoul Journal of Economics20,4. National Statistical Office, Major Statistics of Korean Economy, Seoul, Korea, 2013. Pyo, H.K. (1953-2000)Accumulation and Distribution of National Wealth in Korea Seoul: Institute of Economic Research, Seoul National University, 2002. The Organization for Economic Co-operation and Development (OECD) (2003) Country note on national fisheries management systems, Korea. MAFF (Ministry of Agriculture, Forestry and Fisheries) A Research Report on Fisheries Damages from Saemankeum Development Project. VIII. Shellfish licensed fishing grounds. Korean Fisheries Yearbook Seoul (2013) South Korea. MIFAFF (Ministry for Food, Agriculture, Forestry and Fisheries) (2009) Green growth and Fishing Village of Hope: Design of Future Green Marine Ranching 105. Environmental Justice Foundation (EJF) (2012) Pirate Fishing Exposed. UK. Lee, S.G. (2008) Policies of fisheries management. Design-sea sang, Busan. Ministry of Maritime Affairs and Fisheries (MOMAF) (2005) A Study on the Promotion of Mid and Long-term Fish Stock Rebuilding Plan. Ministry of Ocean and Fisheries (MOF) (2014) National Plan of Action of the Republic of Korea to Prevent, Deter and Eliminate Illegal, Unreported and Unregulated Fishing.